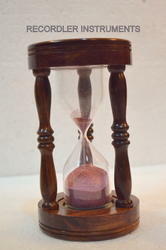 Brass Sand Timer with 5 minutes. Which have been manufactured high quality raw material and are used as a show piece in home, restaurants, bar, factory, office etc. Our handicraft replicas are provide an array of exotic items that have an almost magnetic attraction and mesmerizing effect to you. Sand timer with standard time. Backed by rich industry experience, we are presenting our clients a broad assortment of ST – 2491014. 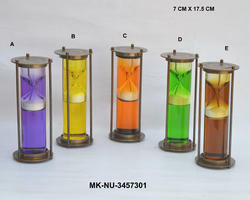 Our product range is provided with a five minutes time tower on the top. The timer is capable of maintaining the time perfectly without any discrepancy. These products are valued for their perfect blend of technology and emotion.